Gozo offers some of the best diving sites, not only in the Maltese Islands, but to some extent even in the world. The island's coast displays a variety of bays, coves and sea inlets with natural caves of all shapes and sizes. In the sea around Gozo one finds an abundance of marine life and spectacular scenery all around. Divers might even be lucky to encounter some archaeological remains. They could also dive through an artificial reef in the form of a purposely-sunken ferryboat that has become one of Gozo's diving mainstays. Water visibility is most often 40 meters and sea temperatures rarely go lower than 16 degrees Celsius. You need a permit to dive in Malta and Gozo. These cost €4.66, and the easiest way to get hold of one is via your dive school, which will provide an application form and arrange for a medical certificate. Once you are certified fit, and have handed in your application as well as proof of certification and two passport photos, your permit should arrive in two days. For further information about diving courses, please contact Gozo Farmhouses Ltd.
Gozo lies away from the heavily fished areas of the Mediterranean and spectacular catches of large fish are still made. Swordfish and Tuna are regularly caught. The speciality of the Gozitan fishermen is ‘Lampuki’ or El Dorado Fish. This gleaming jewel-like fish is caught in abundance from mid-August until the beginning of December. Every fisherman plants his own set of up to 150 floats, on a set course, leading away from the island. Under the floats the fishermen hang bunches of palm leaves, which are an attractive shelter for the migrating fish. The floats can be up to 60 miles out and anchored in 10,000 feet of water. Lampuki is an exciting fish to catch. Plastic squid with hooks are trolled behind the boat, which steers close to the floats. On seeing the bait, the Lampuki makes chase, its glittering body jumping out of the water. Once hooked there is quite a fight. The fish, which is caught by hand-lines, has to be swiftly and smoothly hauled in before the catch is secured. We would strongly recommend that anyone with ‘sea legs’ takes at least one’ days outing on a fishing boat whilst on Gozo. The best season is the Lampuki Season, but it can still be a lot of fun fishing closer to the shore at any time of the year. As Gozo is a small island it can usually provide the required weather conditions. For example, the novice can use a beach on the lee shore of the island and the expert can travel a short distance to the opposite side of the island to find stronger winds. Snorekelling is an easy means of getting a look at undersea Gozo. The best under-water scenery and the largest concentration of marine life are found along rocky shores amid boulders in the nooks and crannies. On rocky surfaces and clefts created by boulder heaps you can explore some colorful growths of soft coral. Gozo Marine life offers rich pickings such as cluster of urchins, common octopus and the amazing red starfish. Swimming is the easiest way to enjoy the water, not to mention cool off and have a sociable time. Apart from the beaches, you find a swimming pool in all our farmhouses except Ta’ Giovanni. Gozo offers fairly good bird watching, particularly during spring and autumn months when migratory birds cross the Mediterranean. Some 320 species have been recorded here, 13 of which are resident birds. The most spectacular are the birds of prey, mainly kestrels, harriers and honey buzzards. Gozo is an undiscovered haven for rock climbers. Cliffs gridle virtually the entire northwest coasts and there are also stretches of inland cliffs. The fact that many stretches of cliffs are uncharted makes climbing in Gozo more exciting. The recorded climbs, moreover are unbolted, a legacy honoured by the small circuit of local climbers to keep the cliffs more challenging. Gozo has an outstanding range of restaurants. From the simple to the superb, you will be pleasantly surprised at the price of all the price of all meals. If there is one thing Gozitans are addicted to it is fireworks. Every tiny village on the island will have it’s own festival and firework display. The festivals highlight strength of the community. Everyone has his or her role-play in the event that will last day and night of the entire weekend. Every street is adorned with bunting, and hundreds of brightly painted Saints create avenues to the church square. At the frenzied peak of celebrations an effigy of the Patron Saint is carried on the shoulders towards to church. Bands play, confetti pours in to the crowds. Tremendous bangs are followed by a phantasmagoria of colour sky. The atmosphere is electric. Few summer visitors will miss this opportunity to partake in this jocularity. There is a festival every weekend from the first Sunday in June to the second Sunday of September. Gozo Farmhouses Ltd offers a variety of Excursions on a half or full day basis. 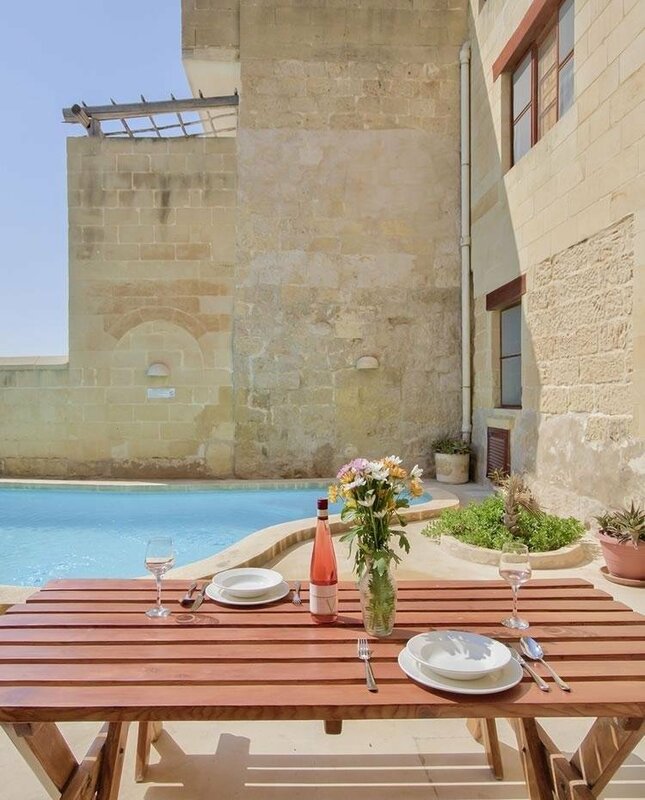 These could be booked through Gozo Farmhouses Ltd representatives. (Tour 1) The streets of Xagħra village. Pass by the Pre historic Temples of Ġgantija, Ta’ kola Windmill, the legendary cave of Calypso, Xerri’s Grotto, Museum of Toys and the Parish Church dedicated to the Nativity of the Virgin Mary. (Tour 2) Ride through the country side from Xagħra to Qala Village, Spectacular views of the Blue lagoon in Comino, Mgarr habour, pass by the Gozo Heritage and Rotunda Church of Xewkija. Due to the climate, the times the horses go out are restricted to 6-9 a.m. and 4-9pm. Tours take 60 to 90 minutes. Horses are a great part of Gozitan life both in work and recreation. The ridding school can enable you to take full advantage of many tracks and paths, which lead to the intriguing parts of the Island. Pony back riding and accompanied pony cart rides for children. A ride on a pony will surely be an experience children will never forget. Tours is in the streets of Xagħra village and learns about the history of this Island. Explore Gozo and Comino's coastline by kayak and enjoy stunning scenery from a different perspective. Visit sea caves, secluded beaches and picturesque inlets. It is a great day out. We normally operate from Hondoq bay but this can change on the day. Please never promise an itinerary. We are wind dependant. The guide takes decision on the day. Full Day Price: €65 per person which includes experienced instructor, picnic lunch, equipment and safety equipment. Tour starts at 9:30am and finishes around 4:00pm. Half Day Price: €45 per person which includes experienced instructor, equipment and safety equipment. Tour starts at 4:00pm and finishes around 7:00pm. Gozo has a great deal to offer a cyclist. Our guides aim to avoid major hills and travel down country road and along sea cliffs to make the most of the spectacular views and quaint villages. Our guide will adapt to the level of the guests and offer a balance of easy, fun and technical riding. Half Day Price: €45 per person which includes experienced instructor, equipment and safety equipment. Tour starts at 9:30am and finishes around 12:30pm. The adventure tour is a great way to see Gozo from an active and different perspective. You can choose two options from the following, and we organise the rest: Abseiling at Dwejra, Biking on the North coast, Snorkelling at Mgarr Ix Xini and Adventure Hiking at mistral rock. This circular walk starts and ends in the village square of Għarb. Taking the left hand road skirting the side of the church leads to open countryside visisting St. Dimitri Chapel and affording a good view of ta’ Ġurdan Lighthouse and Ta’ Pinu Sanctuary. Wied il-Mielaħ is reached via an old paved road next to St. Dimitri Chapel. The hilly features of the Island and the view of the vast expanse of sea stretching beyond the steep cliffs can be best enjoyed from the top of Ta’Gurdan hill. In the book one can find a route map in the center pages, together with several direction signs located along this route, will help you to follow the walk more easily. Distance: 12KM – Time: 4-½ hrs. This circular walk start and ends in Nadur. It takes you from Nadur to Daħlet Qorrot Bay, skirting Mistra Rocks – a boulder shore. Daħlet Qorrot is a typical bay with some boathouses hewn out of the rock: an ideal spot for swimming and fishing. Along the route you will pass by a number of cultivated fields at Ta’ Grejgel valley. Here, both modern and traditional farming methods are put to use to reap the succulent joys yielded by Mother Earth. In the book one can find a route map in the center pages, together with several direction signs located along this route, will help you to follow the walk more easily. The route is suitable for hikes, horse rides and pedal bikes. If traveling by bus to the route starting point, you should check the local bus timetable to ensure that this fits your own schedule. The local weather forecast should be checked before setting off as there is hardly any shelter from adverse weather conditions along the route. A raincoat can come in very handy in rainy conditions. As most of the walk is over open countryside, it is advisable to carry a packed lunch. It is possible to buy food at Nadur, Qala, Għarb & Għasri. If you are interested to buy one of these books ask your representative. The price is € 2.33 each book. Looking for a sailing destination where you find clear water, nice wind, plenty of sunshine all year round, warm weather and warm sea? Yes, even during the middle of winter sailing in Gozo is sheer fun. Air and sea temperatures do not dip below the 15-degree mark. With a 4-ml wetsuit you are pretty comfortable. So on we go to a few sites around Gozo, which can be found to be interesting. When the wind blows Northwest direction the best place to windsurf is definitely Ramla Bay, which is situated on the North of Gozo, a beautiful bay full of orange sand, and excellent spot for all level of sailors. As soon as the wind is stronger than force 4 it is only suited for experienced sailors only, the waves will get bigger and a nasty shore break follows. Ramla is also good in a south wind when you get flat water and plenty of wind coming out of the bay. The only drawback with this bay is that during the summer months the bay is reserved only for swimmers. Gozo Sailing Club is working towards getting a small launching area on the west side of the bay. Another nice place for surfing/sailing is Qbajjar. This bay is very good for all level of sailors. West/Northwest wind is great there and suitable for all, but beware when wind is stronger than force 4 it gets dangerous for beginners. With winds from east to northeast Ħondoq Bay is another popular site with surfers/sailors, a nice jetty to rig up on, and a beautiful view of the island of Comino across the channel. West to South West wind is also great sailing here. It's a lovely site for all levels with a nice gentle breeze up to force 4. It is very good for intermediates to sail across the channel to comino. When the wind blows stronger, you can see the big boys out in a nice rolling swell, Very good constant waves will follow as the wind kicks in. The site is also known to have strong currents. Another good place to consider in a very strong east north east is called Xatt L- aħmar, where you can start in a very flat protected area, but when you are out watch out, great blasting conditions. In a Southeast wind the best place found is Daħlet Qorrot on the North East of Gozo with the wind blowing cross-shore. You have to go out about 20 metres before you get clear wind due to the contour of the bay, but once you are out its beautiful conditions. Another site is Għar Qawla just off Marsalforn Bay, again cross-shore winds but well worth a visit there in a southeast wind. The breakwater on the outer left side of the bay is a good and safe launching site for Westerly and Northwesterly winds up to force 5. Both these places are suited better for intermediate to expert sailors. To sum up, Gozo is a very small island surrounded by beautiful clear waters and you will find for sure a nice place to sail in any condition or wind strength. If you need any more information log on to the Gozo sailing club site at gozosailingclub.gitd.net You can find all you need in this website and contact existing members who would only be glad to sail together with you. If its keelboats you are into, it's an ideal location anytime of year. There is lovely scenery and beautiful small bays to anchor at and have a nice dip in the clear water. A great place is to be found on the north side of the island called St Blas bay very remote place to relax. At night you can always berth on a pontoon at Mgarr harbour. There are shower facilities water, electricity and fuel here. Several good eating-places are to be found too. You can always find berthing space specially during off peak season, for info you can get in touch with the Malta Maritime Authority on (00356) 21558856 or (00356) 21558857.